When crafting a tweet and you have a lot to say—so much so that it won’t all squeeze into that narrow 140 character limit—seeing that minus sign with a blazing red number can be your biggest enemy. Reason being, it can cause a pang of anxiety because it has put a cap on your thoughts. Oftentimes, writing product descriptions can leave you feeling that exact same way. While some may look at the task of writing actual listings as an easy one when compared to hefty sales letters, email sequences, and more, it’s often just the opposite. There’s so much you want to talk about, but so little space to do it. Yet, there are entrepreneurs out there absolutely crushing it, showing it can, as a matter of fact, be done. And, all you need to follow in their footsteps is the right blueprint, helping you write better sales copy for your Amazon and ecommerce store listings. 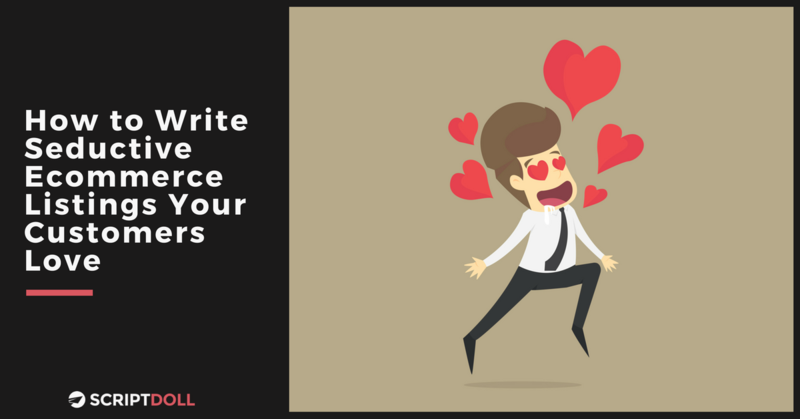 And, that’s why I’m here today—to share with you the how-to you need to write seductive ecommerce listings your customers love. As I mentioned a second ago, however, it’s not always the easiest thing to do. Yes, even when you have a blueprint! Fortunately, I’ve got just the tool you’ve been looking for to quickly check that writing to-do off your list for conversion-worthy copy for your physical product descriptions. Though, we like to save the best for last. So, stick around until the very end of this post to learn more about it. Until then, let’s dig into the tips and tricks you came here for! 1. Know what your ideal customer really, really wants. Knowing that, however, isn’t as simple and straightforward as it was for me to type that line. But, it’s a must, and it should’ve been one of, if not the very first thing you thought about when jumping head first into the world of entrepreneurship. When you re-evaluate why you created your product in the first place, you remind yourself of the components that make it so irresistible to your people that they can’t help but want to buy it. Thus, it’ll be that much easier for you to speak directly to them in your sales copy—calling attention to their wants and needs, while positioning your offering as the solution to solving their “tip of the iceberg” problem. 2. Link up powerful features with powerful benefits. Ahhh, features. Understanding how each one functions and helps make your product all that it needs to be for your people is essential for your marketing efforts to be successful. But, knowing exactly how to link those up with powerful benefits will take things to the next level. What I mean is, features are great and all if you simply want to tell your ideal customer factual statements about your product. But, chances are, those statements alone won’t get them to buy. So, instead, dig a little deeper and share what each key feature does for your customer—aka the selling points, which should focus on the pain points or headaches you’re going to solve. Is it to save them time? Money? Help them accomplish their goals (increase in revenue, help with losing weight, etc.)? Or, even overcome fears (starting a business, meeting new people, etc.)? Well, to give you some inspiration, just take a look at the slew of quality features and benefits listed for the YETI Roadie 20. Think these appeal to the wants and needs of the brand’s ideal customers? Abso-freaking-lutely. That said, go ahead and follow their lead. 3. Back them up with a guarantee. We all have experienced—at least once—the feeling of dreaded buyer’s remorse after handing over our hard-earned money in exchange for a product or service. This feeling is especially prevalent in the world of online shopping. While your features and benefits are certainly key to selling your product online, tossing a guarantee into the mix can aid in eliminating buyer’s guilt. Not to mention, reassure your ideal customer that your offer is vital to alleviating their biggest headache. 100% satisfaction guaranteed. The brand explains this is its way of saying: “We’re so sure you’ll love our awesome products that we’ll refund you in full if you don’t, just contact us.” It’s a fairly painless way of putting your ideal customer’s mind at ease when they’re ready to show you their wallet and grab hold of your offer. 4. Focus on using more evocative lingo to tell stories. So, how exactly can one use more evocative language when crafting descriptions? Well, Nextopia.com advises the use of words that appeal to any and all of the five senses, and words that reference certain aesthetics your buyers would value. Speak to their smell, sight, sound, taste, and touch as it relates to your product. It’s why the wind howls—appeals to sound. Made with water-repellent George cloth—appeals to touch. You see, it tells a story. And, a good one as it connects to the product at hand. While this one might be a bit obvious, it’s definitely one worth mentioning. After all, most of your website visitors don’t want to sit through a chunk of text to scout out why they should care about your product and, most importantly, what’s in it for them. That said, don’t ignore ecommerce guru Shopify’s excellent piece of advice—package your product descriptions with a clear, scannable design to make them easier to read and more appealing to potential customers. If you’re in need of a good example of scannable product descriptions, just explore Amazon.com for all of 5 minutes. You’ll find plenty of bulleted text, product images and videos, and white space, motivating you even more to put your finger to the mouse and click the Add to Cart button. 6. Put it to the test by answering the 5 W’s (& How). Who is this product for? What’s their demographic? What are are their interests? Using that information, are you speaking to them in your product description—explaining how it provides them value? What are the details of the product and what sets your product apart? This includes the basic dimensions, attributes, and features and benefits of your product, as well as what makes you different from competitors. Where would your customers use this product? Is it meant to be used indoors or outdoors? Any unique or funny place you can use it? This is where you can inject some evocative language. When do your customers use your product? Is it when they’re traveling? Is it a seasonal item? Again, call attention to this point by using evocative lingo. Why would someone purchase and use your product? How does it make their lives better? What problem does it solve? Again, is there something unique, fun, or funny? How does your product work? This isn’t always necessary. But, if it’s a new gadget or piece of technology, you may want to describe how it functions to your audience to prevent any confusion. And, you don’t want to make this process sound like rocket science. Think: easy-peasy. Running through this list of questions will put your mind at ease knowing you’ve communicated all the essentials (if not a bit more!) to lock in some serious sales. Ready to sit down and get to writing your ecommerce listings? But, not sure where to start? I get it. I was in those same exact shoes, too, until I found the solution to alleviating my biggest headaches. Meet your new copywriting companion: ScriptDoll. It’s a sales copy engine dedicated to assisting you with composing persuasive ecommerce listings (and sales copy in general!) in minutes. Once you create your product portfolio and answer a handful of painless questions about your product, target audience, and more, ScriptDoll drops those answers into thoughtfully crafted content scripts that sell—sales letters, email sequences, you name it. Frees up your time to put focus towards more productive tasks—simply complete your product portfolio, answer a handful of painless questions regarding your target audience, product details, features and benefits, and more, and ScriptDoll turns your answers into attractive product listings in a matter of minutes, reeling in your ideal customers. Keeps your content fresh with an ever-growing, extensive library of templates—new templates are added on a monthly basis, from sales letters to video sales scripts, email sequences, and much more. You’ll avoid putting your audience into a zombie state-of-mind, no matter your content needs, steering clear of sharing the same thing over and over again. Get The Product Description You Need to Attract Your Perfect Customer—Join ScriptDoll Now for Ecommerce Listings That Sell! Remember, share the key details your audience wants and needs to know about your offer. Link up features with benefits that sell. And, don’t hesitate to use evocative language, text decorations, and formatting. When you do, you’ll—without a doubt—tell a story about your product your people can’t help but love. Thus, sparking their desire to want to buy from you in a flash. Best of all, you’re finally looped in on a tool that can help save you time during the writing process. Entrepreneurs like you are raving about ScriptDoll—relieving them from the struggles of writer’s block to create seductive ecommerce listings with little to no effort. We hope you’ll join them and look forward to you getting the results you’ve been searching for. They’re ready and waiting for you. Have questions or something to share about creating ecommerce listings? Drop us a line in the comments section below. We’d love to hear from you.